Happy to report a wonderful afternoon’s training at this quarter’s Women’s Open Mat hosted at Dartford BJJ. We were lucky enough to have a sister from Portugal stick around after last weekend’s competition at SENI in order, in part, to join us at the Open Mat. As ever, the Open Mat included a range of skill levels, from white belts in their first week to purple belts. The Open Mat continues to follow an informal structure and after a brief warm up, two of the girls took us through drills focusing on a progression of side control to knee ride to mount followed by variations on the X-choke from guard. We finished with a good hour’s sparring, swapping around partners and rolling without time limits. 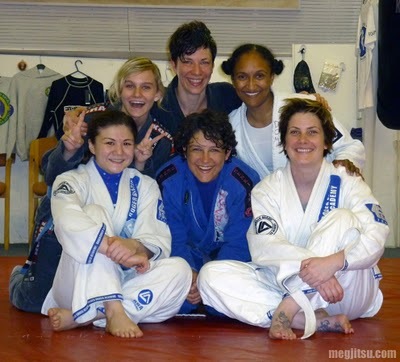 It is such a joy to get on the mats with these women, who consistently prioritize friendly rolling and learning over any conflicts of interest one might suppose could arise in room full of players who meet each other at competition. Truly inspiring and humbling. Next quarter’s Open Mat will be announced within the next fortnight, and I, for one, cannot wait!